This happened yesterday and the photo was taken from our back garden. 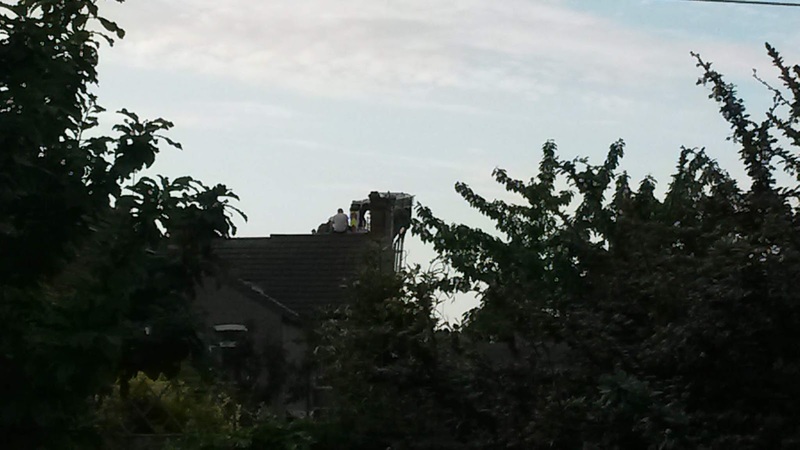 These two took to the roof of someone's house after the police attended, possibly to arrest them. They stayed up there for nearly four hours, destroying roofs and throwing various tiles and bricks at the police, public, paramedics and fire service. They are allegedly the two toe rags that have been riding motorcycles without crash helmets and causing mischief having been chased out of their previous accommodation for similar anti-social behaviour. The police took a softly-softly approach and negotiated as the road was sealed off and they eventually came down via a fire service cherry picker. The general consensus amongst the public was for high pressure fire hoses to be trained on them although some people advocated the use of a sniper! Local children watching shouted "Jump!" from time to time much to everyones amusement. The blitz spirit alive and well as neighbours gathered to watch and discuss the lack of parentage, lack of morals and lack of brains in these two wastrels. Sadly, one of our friends lives there with her small child but luckily they were out although her parked car was badly damaged as a result of their behaviour. We shall be watching the official response and consequences when these two appear in court. I anticipate the usual ineffectual slap on the wrist and they'll be freed to continue causing trouble until they seriously injure or kill someone. Public stocks every day for thirty days, rotten fruit and animal excrement as handy missiles would be my answer followed by public service cleaning up streets for a year with a chance at education and rehabilitation during that year. Re-offend, same again and depending on severity of crime two plus years of the same. For very serious crimes, lengthy or life sentences served in a high security prison on the Falkland Islands is my answer. Good behaviour means access to Skype calls to loved ones, BBC radio 3 and a well stocked library. I am sick and tired of bad and thuggish behaviour by a few scumbags who seem to continue to get away with it. Don't pay your TV licence, council tax or road tax and the authorities are very quick to punish you. Steal, burgle, assault, etc...on a regular basis and a multitude of official and charitable agencies leap in to protect you. Moving on from yesterdays shenanigans and I continue to apply for jobs. One in particular has caught my eye and after a discussion with the manager of said team I was advised to complete a one day legal update to strengthen my application. I am booked in for a course near the Temple, London so a 'day trip' to the smoke is on the books. One of my reasons for being excited about this job is that they are advertising for a couple of permanent staff plus some one year fixed term contracts and for bank staff as well. A number of options and any of those will suit me as I am more than happy to do occasional work. I haven't worked now for six months and I have been surprised by my lack of success in finding work. I guess my age is the main factor but if this latest effort proves unsuccessful then I shall sign up to a nursing agency and seek work via that means. Crazy really because I might find myself working for the very teams that did not employ me from interview and they will pay more to the agency and me for the same role! Does the NHS need more money or should efforts be made to manage resources more efficiently before any new monies is considered? I know my answer and efficiency should be tried first. Enough of that. It is raining so no gardening today, I have a pot of fresh ground coffee made and more internet Sasquatch stories to listen to plus a new one to me, the 'Dogman'! They are apparently found in Wisconsin as well Scoakat so be careful out there. Are these creatures real because there are a hell of a lot reported incidents? I'm abstaining from alcohol this month so the coffee is my treat plus some excellent ginger cake. 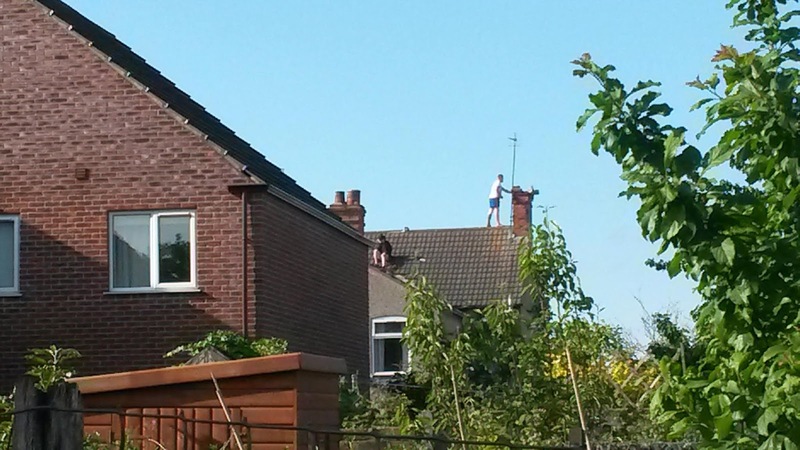 The knuckleheads thought they'd get away by climbing a roof? Not very bright. Good luck on the job! I'm still looking for something different off and on. Not a lot of choices. Dogman? Never heard of it, I'll have to look it up! The stories can be fascinating but if sasquatch is real I would think we would have found something in the way of hard evidence by now. I have to agree with the lack of hard scientific evidence for these creatures. writes a blog about dogmen and she's not too far from you. Intriguingly, I read of a story about one of these creatures in the UK! I'll keep an open but sceptical mind.